Schools in Falkirk Council's area are warning parents that significant cuts may have to be made. Local secondary head teachers have been asked to identify £2.5m of savings, while primary heads have been asked to find £1.8m for next year. BBC Scotland has seen a letter sent to parents at one school warning that this could lead to bigger class sizes or fewer subject choices. Now the council leader has apologised for the concern this letter caused. Scotland's councils are due to find out their budgets next month. 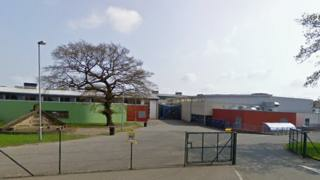 Parents at Larbert High have been told that the school could have to save just over £500,000. The letter says this could lead to the equivalent of cutting 12 teaching staff. Falkirk wants to save a total of £5.83m in children's services in each of the next five years, which it describes as "unprecedented cuts". In a statement the Scottish government said the leader of the council had apologised for the concern raised. A spokesman said: "Since this letter was issued, Falkirk council has made clear that no-one will lose their job nor are they planning compulsory redundancies and there will be no impact on the pupil/teacher ratio. "They have also stated categorically that, while they are looking to reduce costs, they will not reduce the options and opportunities available to pupils. Instead they are looking at schools working more closely together to offer subjects between them. "The leader of the council has apologised for the concern caused by the letter. "We welcome that clarification from the council." BBC Scotland has also seen a letter sent to parents at Beancross Primary School in Grangemouth. It talks of £58,000 worth of cuts to the school's budget. The situation facing Falkirk Council - which is run by the SNP, along with an independent councillor - touches on two wider issues. One is the overall financial situation facing local government. Councils have faced years of financial pressure and council body Cosla wants councils to have more power to raise revenue. The Scottish government, which gives councils most of their cash, argues it has protected local authorities from the worst of so-called "Westminster austerity". It comes amid an ongoing campaign by unions for teachers to receive a 10% pay rise. Head teachers are being asked to come up with ways of reducing spending as a result of moves to devolve more decision-making power to them. Previously such decisions were more likely to have been taken centrally by councillors and the council's education officers. In the past, it would have been highly unusual for heads to seek views on significant cuts to individual schools. Councils are responsible for deciding how much to spend on their local education service but have to work within national agreements. Many schools also receive some direct funding from Holyrood to spend on schemes to raise attainment. This is linked to the number of children entitled to free school meals. The government expects councils to broadly maintain teacher numbers - although exceptions can be made if school roles are declining. Realistically, it is virtually impossible that any teachers will be made redundant. However, attempts could potentially be made to close posts which become vacant. A school could, in theory, save money by cutting classroom assistants or spending less on new resources. Parents have until 7 December to respond to consultations. A spokesman for teachers' union EIS said it would always oppose cuts to school budgets and staffing. He said: "The EIS is already in discussions with the other staff trade unions as to how best to fight these cuts, and is aware that parents' groups are also organising and highly-motivated to protect our schools and the education of our young people." A Falkirk Council spokeswoman said the authority currently faced a budget gap of about £18m in 2019/20. She said: "To address this challenge all senior managers in Falkirk Council have been asked to identify significant potential savings from across all service areas, including education. "Currently, head teachers are discussing potential savings options with school staff and with parent councils. "Council officers are working with head teachers and with trade union representatives to identify how savings will be achieved. "No final decisions will be taken until the council sets its budget in February 2019."